Despite its image as a static, frozen wasteland, the dynamic ice pack above the Arctic Circle plays an important role in regulating the Earth's climate. That's the focus of research conducted at NASA's Laboratory for Hydrospheric Processes at the Goddard Space Flight Center. Unlike Antarctica, the ice covered continent capping the South Pole, there is no land covering the North Pole. But study of the northern pack ice shows that it's not only more complex than initially thought, but also highly influential in the health of the planet. Research and data collection of Arctic Ocean ice isn't easy. 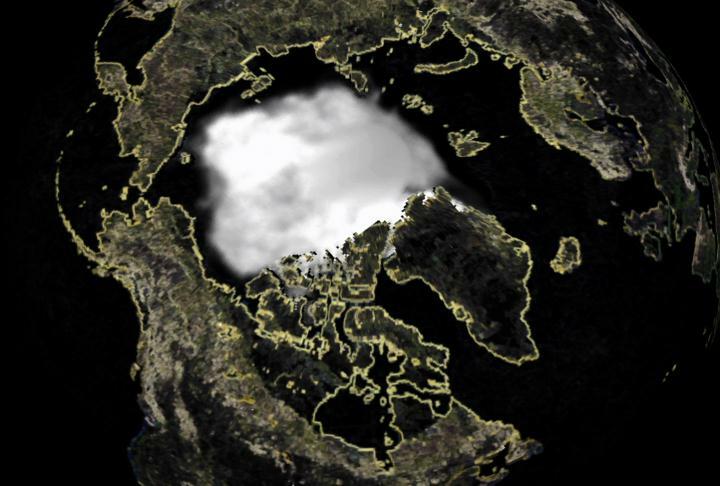 But using data collected by a number of different satellites from 1978 to 1998, scientists have been able to stitch together a quality controlled record of sea ice in that part of the world. The data used to create this visualization comes from different instruments onboard a group of satellites: the scanning multichannel microwave radiometer attached to the Nimbus 7 satellite, and the special sensor microwave imagers attached to the Defense Meteorological Satellite Program's F8, F11, and F13 satellites. Part of the challenge for researchers was in the elimination of bad data, from atmospheric interference to instrument calibration issues and more. The following two visualizations present average annual polar ice concentrations for the nineteen-year period studied. The first visualization displays average ice concentrations in March, the seasonal maximum; the second visualization shows the seasonal minimum, with measurements taken in September. As part of their research into polar ice trends, scientists collected data on the annual spread and recession of ice around the North Pole. One of the features made most clear by their efforts is how the northern ice pack is a dynamic and complex environment, showing seasons much like the rest of the world. In spring and summer, the northern ice pack shrinks and in autumn and winter, it grows. The scientists on this project used observations of seasonal changes in the ice to determine if biannual averages were changing over time. In this visualization, 365 daily measurements of ice concentration are shown for the year 1998. Over a nineteen-year period, the total concentration of ice over the northern part of the globe has decreased, but just slightly. At first glance this visualization appears to be a simple quantitative comparison of North Pole ice over time. In fact it is more subtle. This visualization shows comparative concentration, that is, how much area is covered by ice. It does not compare total amount of ice, nor thickness, nor density. Concentration in this case refers to amount of open water visible from space. In these images, blue represents ice concentrations in 1979 and red represents ice concentrations in 1998. Part of the ongoing research into polar ice trends encompasses evaluation from sophisticated computer models. At the Geophysical Fluid Dynamics Laboratory at Princeton University, run by NASA's sibling agency NOAA, researchers modeled a 5,000 year period to see how polar ice might behave over time depending on several different variables. This visualization shows a 120-year slice of that complete model, essentially offering a research window on to experimental processes that require longer time frames than human lifetimes. According to the model shown here, projecting a period from 1940 to 2060, there is evidence to suggest human factors have had a measurable effect on Arctic ice decreases. The polar caps not only hold much of the planet's total fresh water, but also play an important role in regulating the Earth's temperature. The relevant characteristic is called albedo. It's a measure of how much radiation, or light, is reflected from a body. Similar to how a white shirt helps keep a person cooler in the summer than a black shirt, the vast stretches of polar ice covering much of the planet's top and bottom reflect large amounts of solar radiation falling on the planet's surface. 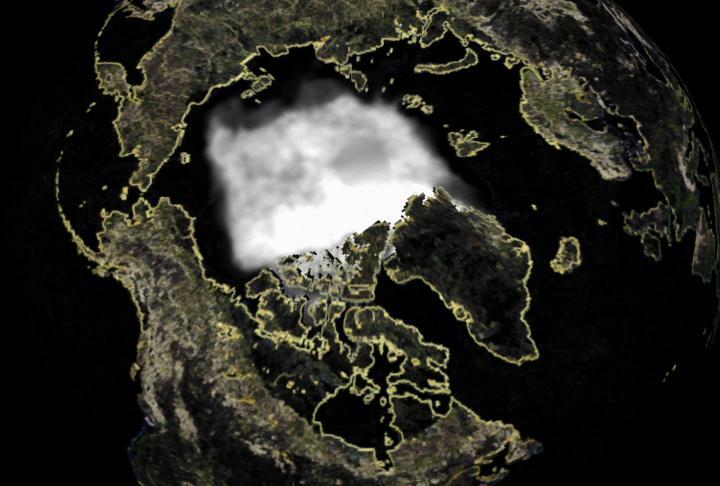 Were the ice caps to appreciably recede, sunlight that otherwise would have been reflected back into space would get absorbed by the darker, denser mass of ocean and land beneath. As light is absorbed, the environment is heated, thus intensifying a feedback loop: a warmer planet yields more ice melting thus an even warmer planet. This animation provides a more close-up perspective of the relationship between ice and solar reflectivity. As glaciers, the polar caps, and in this case, icebergs melt, less sunlight gets reflected into space. It is instead absorbed into the oceans and land, thus raising the overall temperature, and adding energy to a vicious circle. Of the many concerns voiced by scientists who study global warming trends, rising ocean levels is one of the most dramatic. An average rise in global ocean levels of just a few inches could have devastating effects on coastal towns, cities, and ecosystems. Why then is even the slightest risk of a shrinking polar cap not sounding alarms all across the world's lowland regions? It comes down to a simple principal proved thousands of years ago by the Greek philosopher and scientist Archimedes. He showed that a body, in this case the floating ice of the North Pole, immersed in a fluid is buoyed up by a force equal to the weight of the displaced fluid. In other words, since the northern pack ice is already floating its melting would not independently cause ocean levels to rise. However, the attending planetary conditions necessary to facilitate polar melting would likely have other enormous effects on the environment, including the likely melting of the southern polar cap. As the ice over Antarctica is NOT floating, a corresponding rise in the world's sea level would almost certainly result if it melted.